Realizing the vision of K-State 2025 requires an institutional commitment to planning and holding ourselves accountable at all levels. 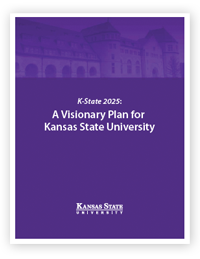 Following completion of the K-State 2025 Visionary Plan in 2011, President Schulz launched an ambitious planning initiative to align college/major units and departmental planning with university planning. 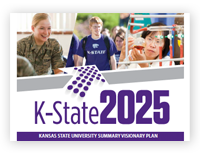 All completed K-State 2025 university, college/major unit, and associated departmental strategic action plans are available here. K-State 2025 is supported by all our aligned plans together. We are updating our K-State 2025 Visionary Plan, having completed the first five years of the fifteen year plan. Learn about this effort and share your suggestions and ideas for changes as we adjust our path to 2025. Read our university strategic plan (pdf) describing our institutional aspirations and goals for K-State in 2025. Click on the links below to see the strategic directions of our colleges, major units, and departments.